The NATIVE YOUTH MULTIMEDIA WORKSHOP participated in the 2017 United National Indian Tribal Youth (UNITY) Conference in Denver, Colorado. The workshop took place July 9th, 2017 during the United National Indian Tribal Youth in Denver, Colorado. Native Youth from our past youth workshops stopped by our booth to catch up, share their future plans and hang out! Thanks to UNITY and the San Manuel Band of Mission Indians for your support! 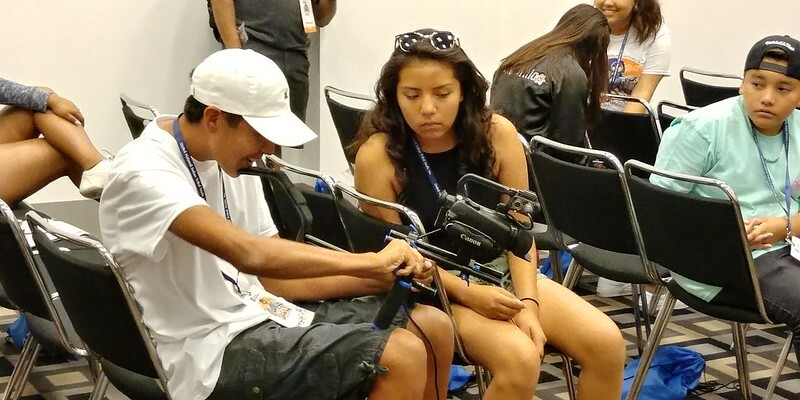 Every year since 2009, the NATIVE YOUTH MULTI-MEDIA WORKSHOP has travelled to reservations throughout North America and Indigenous communities throughout the world to teach youth multimedia skills.The youth films from our workshops are shown at the LA SKINS FEST. This is a premier film festival for Native Americans in Los Angeles. The youth are invited to the film festival as special guests and are brought on tours of movie studios and television networks. Tribal Youth will produce, direct, and edit their own video. The films will be shown at the 11th Annual LA SKINS FEST taking place at the Chinese Theater in Hollywood. Very Special Thanks to UNITY for having us. It was an honor to be invited to the annual conference this summer.